Get an extra pair of eyes. Are you happy with your content but having trouble with the wording? Are you returning to studies after a long break? Is English your second or maybe third language? If the answer to any of these is ‘yes’, then you’ve come to the right place. Our English paraphrasing services are here to help. Unlike proofreading and editing, not so many people are familiar with the concept of paraphrasing or what it involves. In short, paraphrasing is rewording something while still expressing the original idea. It might help you to think of your content as a rough stone being given a hard rub until it turns into a precious diamond. Although it may have adequately served the purpose before, it becomes far more attractive after its transformation. As a student, you might be the smartest in the class, but you are held back by your vocabulary. Paraphrasing is designed to allow you to attain the grades you deserve. International students in particular benefit greatly from the paraphrasing service. You might have every equation memorised and stored in your head, but the examiner can only judge what is on the page. You may write “the car is moving quickly” but your brain is thinking “the vehicle is accelerating at a speed”. If English is your second or third language, it’s not easy to elucidate your arguments. This is where we step in and work our magic. We are language specialists, and so we say: you focus on the content, and we will take care of the rest. How do online paraphrase services work? Reforming and restyling all of your thoughts and arguments into a cohesive narrative. What’s important to note is that the fundamental ideas remain yours; they’re just presented differently. Paraphrasing services are definitely NOT the same as essay writing services. You have to put in the work first, and then we fine-tune your draft. We do not change content and are strictly a language service. So, if you could do with some assistance to elevate your written words, our English rewriting service is the solution. To make it easy for you to see all the changes and suggestions before deciding whether or not to accept them, our editors always use Microsoft Word’s ‘Track Changes’. An added benefit of highlighting any errors and providing examples of how a particular statement could be improved is that your own writing skills will develop as a result of using our paraphrasing services. Transform your writing with our English paraphrasing services. We’re more than happy to accept any type of document for paraphrasing, but we specialise in rewriting university assignments for undergraduate, master’s, and doctoral students. As the success of these may well influence your chosen career path, you don’t want a poor level of written English to result in lower marks than your content deserves. If you’ve worked hard to produce a good essay but are afraid that the quality of your writing may affect your grade, our PhD paraphrasing service is ideal for you. 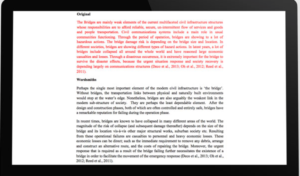 Dissertation paraphrasing is one of our most popular editing services, especially with international students who are often overlooked when it comes to academic editorial support. Not only will our native English paraphrasing service ensure that your undergraduate essay, master’s dissertation or PhD thesis is grammatically correct and free from any spelling or punctuation errors, but it will also ensure that it reads succinctly, fluently and coherently. It’s no wonder that our dissertation paraphrasing service is relied on by hundreds of students from all the major universities across the UK. At Wordsmiths we also understand how difficult it can be trying to manage heavy workloads and the demands of constant deadlines. We recognise that a speedy turnaround is often required if you have a tight deadline to meet, so we’re able to offer fast English rewriting for those urgent jobs. However, this doesn’t mean that we compromise on quality for the sake of speed; you can rest assured that you will receive the same high standard of work and customer service. Achieve the results you want by ordering our dissertation paraphrasing service. Wordsmiths is one of the most trusted and respected UK rewriting services. And because we’re registered as a limited company, you can relax knowing that your content is in safe and capable hands. To ensure accuracy and authenticity, we ONLY employ native English editors to undertake English rewriting. Not only that, but each and every one is fully trained in their craft as well as being a subject expert. Our roster of editors includes academics from the top universities in the UK; many of them have been senior editors of peer-reviewed academic journals, so they know exactly what’s required when it comes to dissertation paraphrasing. And by employing specialists in all academic disciplines and fields, including the humanities and natural sciences, we’re able to assign projects to those editors who are experts in the relevant field. All of which means that you can be sure your text will receive the attention it deserves by qualified, experienced professionals. In addition, we adhere to a strict quality control procedure whereby every single document is double checked by our chief editor/managing director. Should one of our editors ever make a mistake, this system ensures it will be caught and rectified before the document is despatched to you. Currently undertaking a PhD in law after completing a law degree and a master’s, he specialises in law rewriting services. So if you’re looking for an expert in law dissertation paraphrasing, do get in touch. As with all of our professional writing and editing services, you can be confident of receiving superior quality and customer service. Our clients’ needs are always our number one priority. We therefore strive to relieve your stress by providing the most efficient and quality English paraphrasing service possible.